We got word today of an interesting development in the Senate from frequent contributor Tups. Here is the announcement of the bill. The actual bill is here (pdf). I note few things about how this bill and how it was written. First it is a long way from funding a new icebreaker fleet. Second funding through the Navy, while perhaps easier, will not help pump up the Coast Guard’s ship building budget so that adequate funding is seen as normal and expected. Clearly they expect the ships to be built in Washington State. The bill authorizes multiyear funding, but the program does not seem to meet the requirements of multi-year funding. It only talks about up to six heavy icebreakers while the High Latitude Study also talks about medium icebreakers. In fact the most frequently sighted requirement is for three heavy and three medium icebreakers. This may be a ploy to insure that all the work goes to Washington, rather than being split between Washington and the Gulf Coast. Even so, there is a requirement in the High Latitude study for six heavy and four medium icebreakers, under some circumstances. Series production of six heavy icebreakers might bring down the unit cost. It seems the Commandant and his staff have been repeating the same story at every opportunity. I think they are doing the right thing. The Commandant makes a convincing case for why the country should want to do this. The other theme that accompanies it is the need for three heavy and three medium icebreakers, and the fact that the Coast Guard cannot afford to build them without a substantial budget increase. It seems the Commandant and staff are doing their best to make a case for more money for shipbuilding. They are using the DHS Fleet Mix Study to point to the need for even more cutters than provided in the program of record and the “High Latitude Region Mission Analysis” to justify the Icebreakers. I could point to additional shortfalls including the dearth of assets in the Western Pacific, but it looks like the Commandant has chosen his battle, and he is fighting it with determination. The question now is, is anyone really interested in the Polar regions and our neighbors in Latin America and the problems created by the criminals that run the drug trade there. The GAO has recently issued a report, “Coast Guard, Timely Actions Needed to Address Risks in Using Rotational Crews” (pdf) which discusses the “Crew Rotation Concept” (CRC) which has been part of the proposed National Security Cutter (NSC) program for at least a decade, but never tested. I believe there has also been discussion of using it on the Offshore Patrol Cutter as well. This is perhaps the last, worst vestige of the Deep Water program. First there is this explanation of the expectations of the plan from an Acquisitions Directorate web page that has since been taken down. Please forgive me for quoting myself but I feel the need to repeat some calculations from a post from 2010. First assuming the projections are correct, we are replacing 12 ships which would provide 2,220 operating days with eight ships that will provide at best 1,840 so we are already two ships short. Then you will also note that the presumption is that the ships will be operated in groups of three from the same home port, but there are only eight ships planned, meaning there will be a rump group of two somewhere. Will they be operated by three crews or by a single crew per ship? What we hope to save here is acquisition cost, because the operating costs per op day cannot be lowered by this strategy and will actually be higher. I don’t know the projected life cycle costs for the National Security cutters, but in general, I’ve heard that the acquisition costs for similar systems is about 15% of the life cycle cost. Fuel and personnel costs are the real driver. Fuel costs should be the same per op day. Personnel costs will actually be higher, since each crew under the multi-crewing concept will only provide 172.5 op days instead of 185, so personnel costs will be 7.25% higher. In addition, because the ship will only be in port 135 days a year instead of 180, there will be fewer opportunities for the crew to make repairs. These repairs, normally done by the crew, will have to be done by contractors at additional costs. I would also note that the acquisition costs we hope to save actually decline as we add more ships. Four additional units are likely to cost far less on the average than the first 8. There is also the long term value of having four additional ships in hand if the country should need them in the future. Frankly I don’t think we will see any significant savings from this manning approach and it may actually cost us in the long run. If a truly convincing argument can be made for the concept, I would like to see it. And if the argument involves lower overhead because we get more “mission” op days compared to RefTra day, remember the reason we go, is to train the crews, not the ships, so every crew will needs to go. As I noted above three into eight does not make for three ship groups. At that time, I thought it would be two ports with three ships and one with two, but in fact, apparently the intention is now two in Charleston, two in Honolulu, and four in Alameda, so it is three ships nowhere. I am a little surprised the testing has not already started. After all we have had three ships in Alameda for three years now. As far as I can tell, rotating multiple crews among multiple ships has never worked out. More here and here. We have certainly had the opportunity to test the concept on simpler platforms, but it has yet to be attempted in earnest. Frankly I think everyone knows this is not going to work, but they have just been pushing facing the embarrassing truth off into the future. There may be viable alternatives to swapping out entire crews. In fact, apparently crews of existing NSCs have been augmented to allow them to provide 210 days away from Homeport. Actually nine augmented ships, U/W 210 days a year, would provide more availability (1890 days) than eight multi-crewed ships U/W 230 days a year (1840 days) but they would still not reach the level provided by twelve un-augmented ships (2220 days). Unlike wine, bad news does not get better with age. It is time to bit the bullet. Try CRC or find an alternative. If it doesn’t work, well it was really someone else’s idea after all. DefenseNews.Com just posted a three part video interview with the Commandant. Each segment is five to ten minutes in length. The Commandant notes, in the first two months of 2015 we have seized more drugs than we seized in all of 2013. He talks about establishing priorities and specifically mentions the Arctic and Western Hemisphere Drug enforcement. He did not say what will drop out. The Commandant has quite properly put emphasis on the OPC, and he has hit the point that spreading out procurement will cost more in the long run. He talked about icebreakers and discussed how we will need help funding them. He is pushing the results of the previous High Latitude study, saying the US needs three heavy and three medium icebreakers. Here he repeated themes from the State of the Coast Guard address. The importance of defending against Cyber attacks both within the Coast Guard and in the larger Maritime Transportation industry, the formation of an Arctic CG forum, and making the Coast Guard a hostile environment for those that might attempt sexual assault. Seems the Commandant has recognized the need to sell the service and push for more funding, particularly for AC&I. It would not hurt to see the rest of the Coast Guard repeating the themes that he seems to have focused on, to make sure the message gets delivered. The Commandant will continue to focus on the six major topics he highlighted in the State of the Coast Guard Address. Specifically I expect to see a lot more Coast Guard effort in the Eastern Pacific Transit Zone; we will continue to hear that the US needs three heavy and three medium icebreakers as the Commandant pushes for supplemental icebreaker funding; less obvious, but I think he is laying the ground work for an attempt to speed up the OPC construction schedule which would require at least another $500M annually in the AC&I account. There will be a lot more emphasis on cyber and tougher action on sexual assault. In terms of the objective of “maximizing return on investment,” I think we will see closer examination of fuel efficiency, manning, and other operating economies as a basis for where to invest modernization dollars. The video above is long (one hour and forty two minutes) but I think it is important, and it might even make you mad. This is a hearing before the House Committee on Transportation and Infrastructure’s subcommittee on the Coast Guard and Maritime Transportation. The first hour and ten minutes are fairly routine and I’ll summarize some of it below. It includes the obligatory thank you to the Department Secretary (Secretary Nepolitano has been “particularly supportive”) when in fact the Coast Guard has been cut far more deeply than the rest of DHS. The real meat begins with Ronald O’Rourke’s presentation at 1hr.10min. (1:10 to 1:15) Mr. O’Rourke’s stance is neutral, as befits a good researcher, preparing a balanced assessment for the law makers, but he succeeds in making some of the best arguments I have heard for increased funding for the Coast. (Unfortunately this seems in marked contrast to the passivity of the Coast Guard leadership. Hopefully this is more apparent than real and there are things going on that we do not see. There is some indication this is true, here and here.) He also takes the Coast Guard to task for not employing multi-year and block buy contracting. (1:19 to 1:24) Dr. Korb advocates a Unified National Security Budget that looks as trade-offs between the Departments of Defense, Homeland Security, and State. He also advocates including the Commandant in the Joint Chiefs of Staff and appointing a Civilian Service Secretary to act as an advocate. Later, when questioned, he points out that the Coast Guard’s unofficial motto is “We can do more with less” and if that is what you ask for “that is what you will get.” Among his telling points was that the Navy budget is 16 times that of the Coast Guard even though they have only eight times the people. (1:24 to 1:42) Testimony of these three witnesses continued in response to the Representatives’ questions. You can take a short cut and read the text of the prepared statements, but the Congressmen’s questions and reactions are also instructive, and generally supportive of the Coast Guard. Vice Admiral Currier’s prepared statement was completed at 14 minutes. Questions, answers and committee member statements continued to 1 hour and 10 minutes. C-27J: The Coast Guard is apparently counting on getting at least 14 of these aircraft, perhaps as many as 21. Eighteen C-144s have been funded so far of a total of 36 in the “Program of Record.” Substituting C-27Js (which do have a higher operating cost) for the remaining 18 could represent a savings of up to $800M in acquisition costs. Calling it a strategic pause, the Coast Guard has zeroed additional C-144 purchases as it waits to find out if it will get these surplus Air Force assets. Zeroing future C-144 purchases accounted for about a third of the reduction of the CIP compared to last years. As much as I have supported this course of action, and as confident as the subcommittee sounded, this is really not a done deal because the Air National Guard wants to keep the planes and they are very well connected politically. Additionally there are others who also want these aircraft. Webber Class WPCs: Another major change was the decision to fund only two Fast Response Cutters annually instead of the four or six funded previously. Simply spreading out the buy is a really bad decision. Building six per year cost less per ship. Buying only two per year will require a renegotiation of contract. In addition, inflation in the ship building industry is not only higher that inflation in general, its rate is higher than the interest rate on government borrowing, so it would cost less in the long run to borrow money and build as rapidly as we can, even including the interest paid on the bonds. This consideration applies to the Offshore Patrol Cutter as well as the FRC. I don’t think this is the last word on construction of the FRCs, and we may see more money added to the budget. 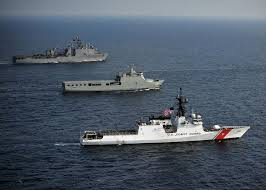 Bertholf Class WMSLs: It now appears all eight National security Cutters will be completed, but we can waste time and money if we do not fund long lead time items and this is currently the plan. This was also discussed and generally deplored. Multiple Crewing: Questions were raised about when the Coast Guard would demonstrate the “Crew Rotation Concept” which has been touted as being able to provide 225-230 days per year from each of the larger cutters. The Vice Commandant responded that the plan would not be implemented until 2017, but until that time the NSCs are expected to average 210 days AFHP. Offshore Patrol Cutters: VAdm Currier said the CG expects to select to three preliminary designs for further development by the end of this FY, and that the final selection will be made a year later, by the end of FY2014. Unmanned Air Systems: The uncertain future of the Coast Guard’s Unmanned Air Siystem (UAS) programs, and its dependence on the US Navy’s development, was discussed, with Representative Garamendi pointing out this represented a major hole in the Coast Guard’s plan to maintain Maritime Domain Awarenes (MDA). Response Boat Medium: A Representative questioned why the Coast Guard had stopped the Response Boat, Medium program at 170 RBMs rather than building the 180 approved by Congress, without submitting a justification report for the smaller program as required by Congress. Port Security: Representative Janice Hahn, California, expressed discomfort with the current container inspection rate of only 2 to 3%. She also suggested the possibility of diverting from some customs money to port security. The Arctic: A pleasant surprise was that VAdm Currier expressed confident that the Coast Guard can already demonstrate good Maritime Domain Awareness (MDA) in the Arctic. Don Young, Alaska, asked several questions about icebreaker. 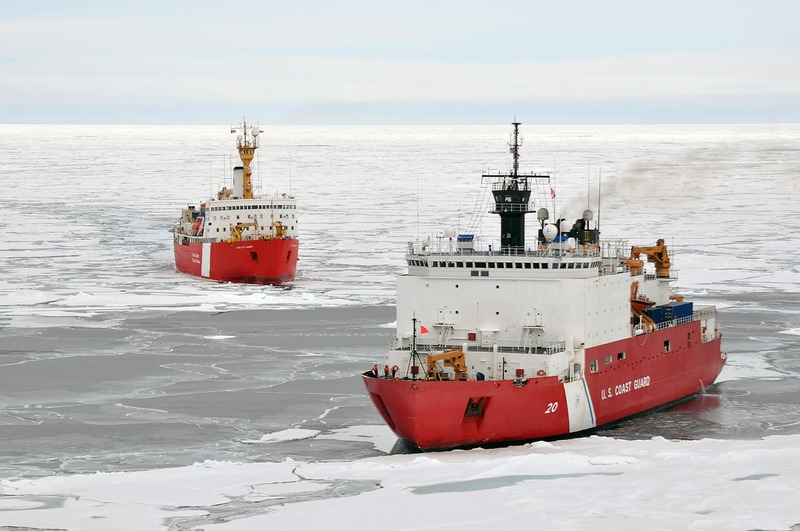 He opined that the Coast Guard should lease an “American built” icebreaker, never mind the fact that no heavy icebreakers have been built in the US since the Polar Sea. We could of course lease a ship someone would call an icebreaker, but that sort of misses the point. VAdm. Currier did say the Polar Sea could be returned to operation after about three years work at a cost of $100M and have a seven to ten year additional useful life. Missions: The question, what missions the Coast Guard will not do, given reduced funding. The only answer was that we will have to make some tough choices and the CG and the Department will do a portfolio analysis, date of completion unknown. Tone: Generally the Committee was supportive. The irony of spending $5B for an East Coast Missile Defense system while shorting the Coast Guard assets that are necessary to prevent a much more probable method of introducing weapons of mass destruction was not lost on the Committee. They also saw the foolishness adding $46B to beef-up patrols along the Mexican Border and simultaneously undercutting the Coast Guard. They also discussed the double standard by which they could write a $2.6B blank check to purchase unspecified aircraft for Afghanistan, while demanding detailed justification for all Coast Guard purchases. They seemed to recognize that if “National Security” were considered in a holistic fashion, the Coast Guard would do a lot better, but that the committee structure in Congress prevented this kind of evaluation of trade-offs. Sexual assault: The Vice Commandant addressed this in his prepared remarks and it was also discussed in the subsequent question and answer period. There was a clear message from the three civilian witnesses that the Coast Guard has not learned to “play the game,” that the Coast Guard has been excessively modest in pointing out its needs, and that because of this reticence important missions are being short changed. We have repeatedly told our elected representatives about our successes, but that leaves the impression everything is alright. Everything is not alright. We need to keep reminding them what is not getting done and the possible consequences of inaction. Every time a Congressionally mandated task is not done to the fullest extent, it should be reported, and they should be made to understand that the reason it was not done is lack of resources. We need to put the onus on Congress and the Executive. When asked what mission the CG will not do, Adm Currier “we can adjust.” Given an opportunity to address why the aging fleet’s patrol hours now down 8-12%, Admiral Currier said, Currier, “We are OK for OPC/MEC” (Frankly I don’t think that is true. The Coast Guard’s own studies point out a need not only for newer replacements but also more ships) and “The gap is in the Offshore and the NSC is key.” The construction of the eight NSCs seems assured, it was time to point out how the fleet will continue to age and deteriorate. We can expect even more breakdowns and higher maintenance costs for the legacy fleet. In the nine years 1964 to 1972, 28 new ships entered service with the Coast Guard (3.11 ships per year). Only three have been replaced and we are building at a rate of less than one a year, and we don’t expect to deliver more than one replacement per year until at least 2023 and then never more than two a year. Things are going to get much worse before they get better. We have done an absolutely terrible job of conveying an sense of urgency in replacing our over-aged patrol ships. I have on my desk the August issues of the Navy League’s magazine “SeaPower” and the US Naval Institute’s Magazine “Proceedings.” Both magazines carry happy glowing reports of the Coast Guard’s successes. There is hardly a word about the growing problems with our major cutters. There is hardly a mention of the OPC and certainly no article designed to explain the urgency of its funding and why the naval and maritime community should be excited about it. The Coast Guard needs to publish a 30 year ship building plan. When I first saw that the Navy was doing this, I thought it was ridiculous, but think about what it does for you. It lays out intentions far into the future and prepares the decision makers to deal with uneven funding requirements. It also highlights the bow wave effect of deferring acquisitions. If the Coast Guard can get seven to ten years out of the Polar Sea for $100M then compared to 30 years from a new $800M to $1B icebreaker then the costs are not out of line. Perhaps we should not reject the idea. By the time the new icebreaker is ready, the remaining life in Polar Star will be used up (if it actually lasts that long) and we will still have only one heavy icebreaker. Putting an second heavy icebreaker into the fleet, as soon as possible, is the best way to create a presumption that there will be a second new icebreaker to follow the one currently planned. These ships break, we really need more than one. Perhaps it is also time to make another examination of the legacy of Deepwater that is still with the Coast Guard. Are there alternatives to the long range aircraft/UAVs and the ship types that have been perpetuated long after the program failed? The Coast Guard has belittled its role in national defense and in doing so has also minimized the future utility of its assets in this role. Fear is a stronger motivator than altruism. We need to recognize that the nation is motivated more by fear than by the desire to do good or maintain its infrastructure. This is the reason the Defense Department is well funded. The national defense role of the Coast Guard, both against terrorism in peacetime and as a naval auxiliary that can bring needed additional numbers to the fight in wartime needs much more emphasis. It is obvious, listening to the subcommittee, that the counter-terrorism role was what they had in the forefront of their minds. The August issue of US Naval Institute Proceedings is appropriately enough, the “Coast Guard Issue,” although less than a third of the content is Coast Guard related. I was disappointed but not surprised to see that there was no article about the OPC. It includes four articles that are written by Coasties, active or retired, and includes a “rouges gallery” of CG flag officers and senior enlisted as well an orgainizational chart. There is one particular article I’d like to recommend that actually dares to be a bit controversial, and it is available on line, “Reinvent the Fifth Armed Service, Quickly”. I think it is definitely worth a read. integration of DHS maritime aviation and vessel fleets. As I say it is controversial, it is going to ruffle some feathers, and hopefully it will start some thinking and some discussion. Both Fiercehomelandsecurity.com and Homeland Security today. have reported on the Senate’s reaction to the Coast Guard’s Five Year Capital Investment Plan, but until last night I had been unable to get much detail. I have found a one page summary, and I have to say it is profoundly disappointing. While I don’t have access to the narrative that I am sure accompanied this, some things are apparent. The “Program of Record” still stands but realization is being substantially delayed. The Coast Guard will apparently get all eight of the NSCs currently planned with #8 to be funded in FY 2015. The long delayed Offshore Patrol Cutter Program, which had been expected to award a contract for the first ship in FY 2015, has been delayed two years with first construction to be funded in 2017. This means the first ship will likely not be completed until 2021. The Homeland Security Today report says that the Fast Response Cutter (FRC) Program will average four a year, but looking at the out-year funding, $110M/year in FY 2015-2018, I find it hard to believe that is enough for even two per year, since the program is mature and we have been budgeting about $60M each. There is a total of $221M in the five years for In-Service Vessel Sustainment. This will apparently fund renovation of 140ft icebreaking tugs and 225ft buoy tenders. Over the planning period $230M is expected to go toward the new Polar Icebreaker, but with no more that $100M in any one year, clearly there will be no construction contract until after FY2018. The second largest total, $76M over the five years will go to “Long Range Surveillance Aircraft (C-130H/J).” This is not enough to buy new J models, so apparently this will go for upgrades to the existing C-130Hs. There is $16M in FY 2015 and $20M in FY-2016 for the MPA (HC-144) program, other years are zero, but totaled, this $36M is less than the cost of the last aircraft purchased. There is $48M for Unmanned Aircraft Systems in FY-2016, but other years are zero. $6.7M total is in FY2017/2018 for H-60 conversion. The Commandant is making good on his pledge to keep together the procurement organization built up painfully over the years. AC&I Personnel and Management is essentially level, ranging from $110.2M in FY2012 to $119.3M in FY2018. Investment in C4ISR continues with just under $237M planned over the five year period. Major Shore, Military Housing, AtoN, and S&D took a big hit going from $112.9M in FY2012 to a total of $82M over the entire five year period. Both “Fiercehomelandsecurity.com” and “Homeland Security Today” note that DHS is apparently funding a new “Bio and Agro Defense Facility” at the expense of the Coast Guard budget. One might ask if the proposed Bio and Agro Defense facility doesn’t duplicate tasking already assigned to Center Disease Control, the Army’s bio lab at Fort Detrick, and the FDA, FBI and USDA laboratories. And where will this new lab get its expert staff except from existing labs by offering them higher wages to induce them to move to Kansas? There are many labs, there is only one Coast Guard and procurement of replacements have already been too long deferred. I have been reminded that the decision to fund long lead items for the first OPC in FY2016 and construction of the first in FY2017 was made last year and that it was published in June. So we are on schedule, relative to the revised schedule, even if the large amounts of money projected for FY2015 in the 2012 and 2013 budgets are no longer there. Hopefullly is will not take four or five years to build the OPC and we may see it earlier than 2021. In the old days we could have certainly have funded the ship at the beginning of FY2017 (Oct. 2016), and have had delivery by the end of 2019, when we have been saying the first ship would be delivered, but I remain skeptical. The Detail Design contract is still expected in FY2015 with options for long lead time items and construction in the out years. I’ve been informed this is the current projected schedule for the OPC.